Dr Tom graduated from the University of Queensland Veterinary School in 1992 and then worked in a mixed dairy practice in Northern Victoria. After two and one half years of midnight calvings he thought overseas work might be more appealing and found himself in Macau where he worked as a small animal veterinarian for six years before moving to Hong Kong in 2001. 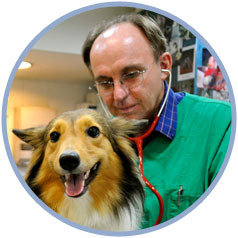 In 2005 he bought into partnership with Dr Ewa who had started Phoenix Animal Clinic at roughly the same time that Dr Tom had moved to Macau. In his spare time he loves playing golf which luckily for him one does not have to be good at to enjoy. He shares his home with Puss and Chung who came into his life after they had been dumped at the clinic as kittens. On a professional level he is interested in ultrasonography, cardiology, soft tissue and orthopaedic surgery. He is currently studying for a Certificate in Advanced Veterinary Practice- Cardiology from the Royal College of Veterinary Surgeons in the United Kingdom.